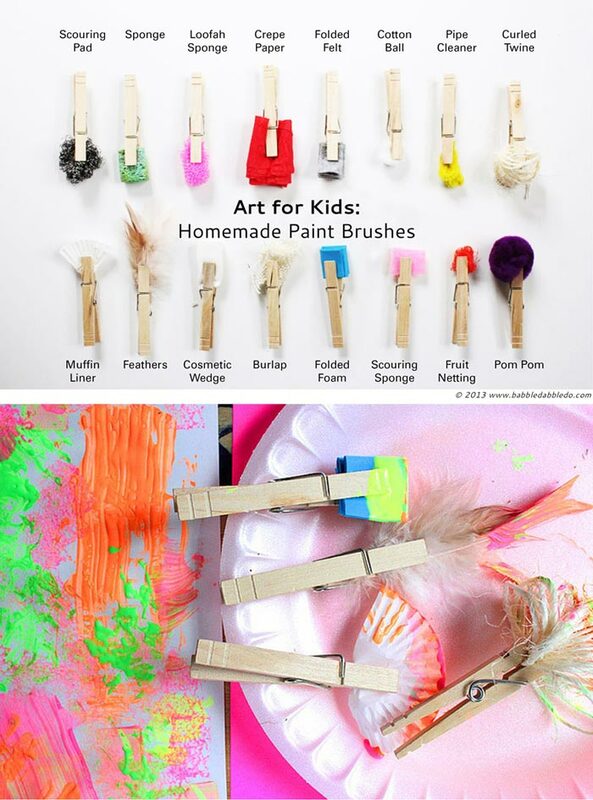 Today’s art project for kids doubles as a wonderful STEAM challenge: Ask kids to make DIY Paint Brushes. 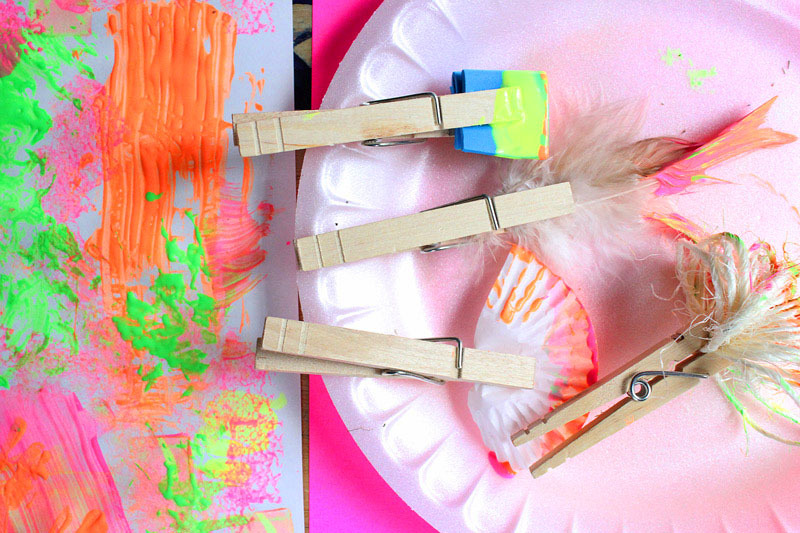 The sky is truly the limit with this project, all you need are some clothespins and some creative ideas for what might make an interesting paintbrush. So if you are ready to make some DIY Paint Brushes let’s get started! Fun Items for brushes! See suggestions below. Step One Gather your materials and cut larger materials down to size. We cut strips of the fabric and foam to fold into brushes. That’s it! I mean it! Read my lips: YOU.ARE.DONE. Get some paint and paper together and ask your child to start testing out the different brushes. We tried both painting and stamping with them. Some of them made great homemade stamps. My daughter and I had a blast testing each of the brushes out. You may also want to keep brush materials handy to make new brushes once you see how they are working. My daughter made an awesome pipe cleaner brush shaped like a “Y” that made two lines. Pretty smart girl that one! Fabienne Verdier. One thing I love about writing this blog is researching artists, designers, and scientists to tie into each post. I had never heard of Fabienne Verdier until I researched artists who use unusual brushes and now I am completely awestruck by her work. Ms. Verdier is inspired by calligraphy and uses enormous brushes to make calligraphic type paintings. And when I say enormous, I mean gigantic! Google her, you’ll see! She needs a special steering device to control these brushes which hang from the ceiling of her studio. She is an inspiration! Off topic, googling “artists who use unusual brushes” will lead you to some rather “interesting” artists who use specific body parts to make art that I wish I could forget seeing right now. Oiy vay! So which of the DIY Paint Brushes did Clara and I decide was our favorite after trying all of them out? Drum roll please…..the cosmetic wedge! It can be used like a stamp or a brush and nicely absorbs just enough paint to make it useful and controllable. Plus it makes a super squishy sound! What I love most about this art project for kids is that it was all about the process, not the product. It truly is an art experiment and a great way to show your kids how to be resourceful and imaginative when it comes to art. So the next time you run out of paintbrushes, stop and scour your house for some materials and make your own brushes from scratch! If you enjoyed making paintbrushes you’ll surely love making a homemade stamp! And for more ideas on DIY art materials be sure to visit a super popular post here on Babble Dabble Do: 40 Art Materials You Can Make At Home. These are so clever! Can’t wait to make these over Thanksgiving break with the kiddos. Thanks! Thanks Kristen! I knew they would be right up your alley! We LOVE painting with different found objects! The implied and actual texture they create make for interesting process based art 🙂 We just made Yarn Paintbruhes that we are in love with! It’s so much fun to paint with different things, right? Mind if I copy this and post it on my blog? I’ll give you credit of course!!!! This is such a fun idea!!! Thanks for asking. You may use one photo and a link back to my site. Copying the entire post is a violation of copyright law. Glad you enjoyed the project! That’s what I meant by “copying”! *wink* it’ll be in Spanish too! I basically wanted to use the pic of all the brushes and the idea and blog my experience with the twins playing with your homemade brushes! And I’ll link it too! Thanks!!! I really appreciate it! Why not teach them how to make real paint brushes? This is an activity that is all about inventing! A treasure hunt would be an awesome idea to fold in! Thanks! It is definitely an remarkable web page!